At least three people have been killed and six churches attacked in Niger amid fresh protests against French magazine Charlie Hebdo's cartoon depicting the Prophet Muhammad. Protests began outside Niamey's grand mosque and reportedly spread to other parts of the country, a day after five were killed in Niger's second city. Niger's president condemned the violence and appealed for calm. Last week, Islamist gunmen killed 12 people at Charlie Hebdo's offices. The cover of the magazine's latest edition, published after the attack, featured a cartoon of the Prophet Muhammad weeping while holding a sign saying "I am Charlie". Seven million copies of the edition are being printed in view of extraordinary demand, distributors announced on Saturday. The magazine's print run before the attack was 60,000. In Niger, a former French colony, hundreds of demonstrators gathered at Niamey's grand mosque, shouting "God is Great" in Arabic. "I just rushed and told my colleagues in the church to take away their families from the place," he told the BBC World Service. "I took my family to take them out from the place. When I came back I just discovered that everything has gone. There's nothing in my house and also in the church." Niger's President, Mahamadou Issoufou, was one of six African heads of state to attend a unity march in Paris after the attacks against Charlie Hebdo. "Those who loot these places of worship, who desecrate them and kill their Christian compatriots... have understood nothing of Islam," he said after Saturday's violence. 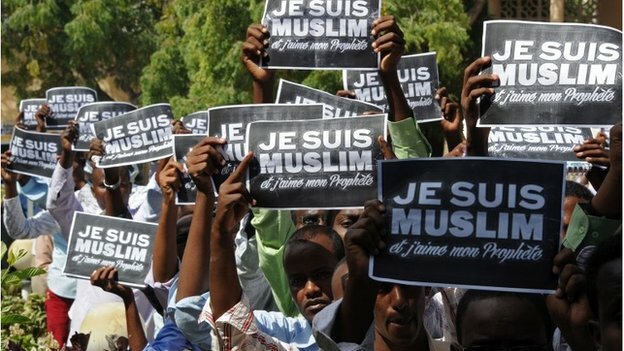 During Friday's demonstration in Niger's second city, Zinder, protesters raided shops run by Christians and attacked the French cultural centre. The centre's director, Kaoumi Bawa, said an angry crowd of around 50 people had smashed the building's door and set fire to the cafeteria, library and offices.